Western dressage originated when a couple of western trainers got together to look for a discipline that would suit a nontraditional western horse and rider. Today’s equine industry is ever changing, and the need for east to meet west was great. Western dressage is based on classical dressage principles, but follows a system of training for the western rider. Similar to classical dressage, western dressage is held in a large or small dressage arena. Judges are still looking for a relaxed, soft topline, good movement, harmony, and accuracy. The difference being that the tests reflect the movements and maneuvers asked of a Western horse. Inclusiveness is important to the Western Dressage Association of America (WDAA), any breed that can walk, trot, and canter can participate. The levels are quite simple. Currently Western dressage has levels from Intro through Level 3. They are similar to traditional dressage tests in their progression. The Intro tests are like the Intro tests for traditional dressage in that they only require the horse and rider to walk and jog (trot). The next level called Basic is similar to Training Level and adds the lope (canter). The Western dressage Level 1 is similar to upper Training level and First Level. Level 2 similar to Second level and Level 3 to Third Level. 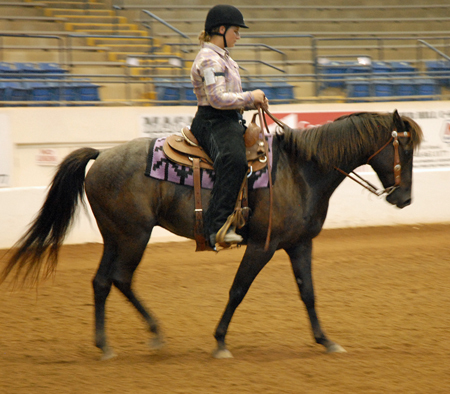 In western dressage, a traditional western saddle is used. The bridle can utilize either a snaffle or shank bit. If the rider uses a snaffle bit they can choose to ride one or two handed, but must remain with whatever they choose throughout the entire test. When using a shank bit, the rider must ride with one hand. A list of legal bits can be found here. Any additional martingales, gadgets, boots, tail wraps, and nose covers are cause for elimination. Traditional dressage allows for figure eight, flash, and dropped nosebands. Western Dressage does not. A whip no longer than 47.2 inches is allowed in all tests. For more information make sure to check out the Western Dressage Association (WDAA) rules. As with all Pony Club activities an approved helmet is required any time the rider is mounted. Otherwise, western dressage attire is similar to most western disciplines. A long sleeve shirt with any type of collar is typical. Jeans or trousers are acceptable leggings and can be worn with chaps, shotgun chaps, or chinks. Paddock boots, cowboy boots, or a riding boot with a heel are acceptable footwear. Spurs are allowed per WDAA rules. In the same manner traditional dressage tests can be read aloud, all western tests can be as well. And while “clucking” and other use of voice is not allowed in traditional dressage, it is allowed in western dressage. Otherwise most of the rules are similar or the same as traditional dressage tests. The best thing to do is read the rules and/or ask if there is a rule you are unsure about. So, if you ride western, but want to find something new to do with your horse or just need a break from the same old, same old, try Western dressage. This is the first year it will be offered at Pony Club Championships East and West with riders able to ride tests from Basic to Level 1 and up. Riders must be D-3 in Flat, Dressage, or Western and D-3 and above in Horse Management. The rulebook followed will be the Western Dressage Association Rulebook (WDAA). For more information check out the Championships information found here. Meet your 2015 NYB Board Members!